Section 285BA of the Income-tax Act, 1961 requires furnishing of a statement of financial transaction (SFT) for transactions prescribed under Rule 114E of the Income-tax Rules, 1962. The due date for filing such SFT in Form 61A is 31st May 2017.
of filing the Income Tax Return of the reporting person / entity. Entity having PAN can take only PAN based ITDREIN. Entity having TAN can generate an ITDREIN only when such TAN's Organisational PAN is not available. least one of the Transaction Type is reportable. 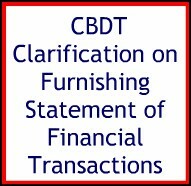 A functionality "SFT Preliminary Response"
transaction type is not reportable for the year. the “Help” section and Form 61A utility and Schema are available under the download section of http://www.incometaxindiaefiling.gov.in and https://www.cleanmoney.gov.in. Online filing of form 61A requires a valid class 2 or 3 digital signature certificate of person responsible for filing the same. Please refer “DSC Management Utility” manual under help section on how to generate the signature file, attaching the XML with signature and uploading of XML with signature file in e-Filing portal.